We're hobbyists, just like you. After we bought our first lathe, we discovered that it wasn't much use without additional tools and other widgets. There was no information in the box that explained exactly what was needed or where to get it. 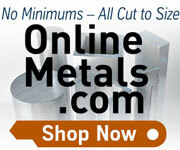 LittleMachineShop.com provides the information and the products that we wished we had found when we first started out. We're not a big manufacturer or distributor. Although this Web site started out as a hobby, it has grown into a thriving retail outlet. And like our machine shop hobby, we take this business very seriously. Be assured that your order will be given careful attention by our small staff. We want to be sure that you're treated just the way we would want to be treated: fairly, honestly, and courteously. LittleMachineShop.com is a division of Siechert & Wood, Inc.